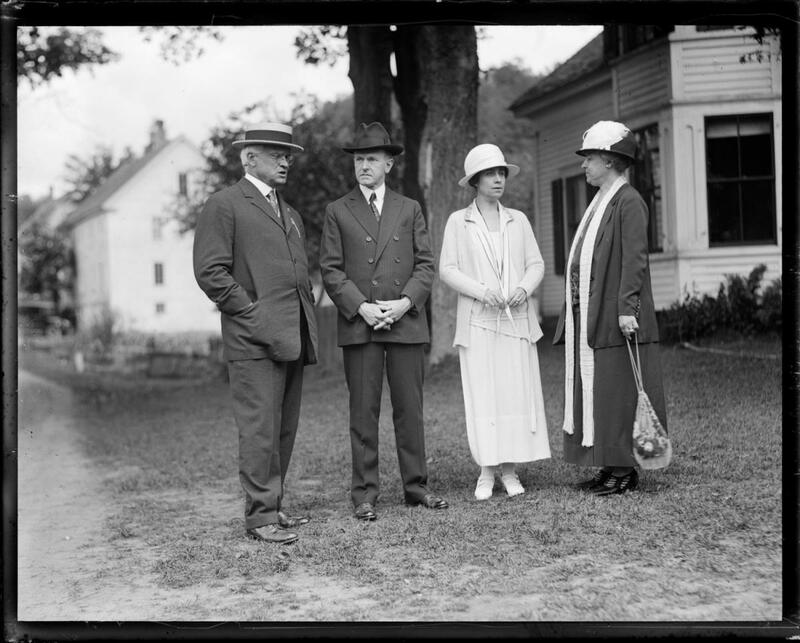 On August 18, 1924, the Coolidges were comforted after the death of their youngest son with the visit of long-time friendly faces from the Massachusetts General Court days, Colonel and Mrs. Treadway. 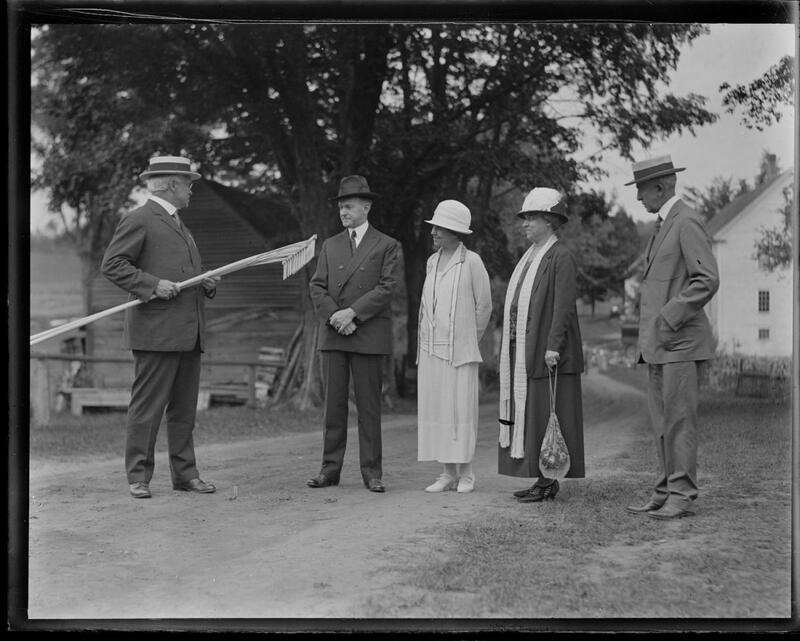 Now representing the first congressional district of their state, Colonel Treadway presents the gift of two custom-crafted hay rakes made for the President by Marshall W. Stedman of Tyringham, whose family had made rakes for four generations. 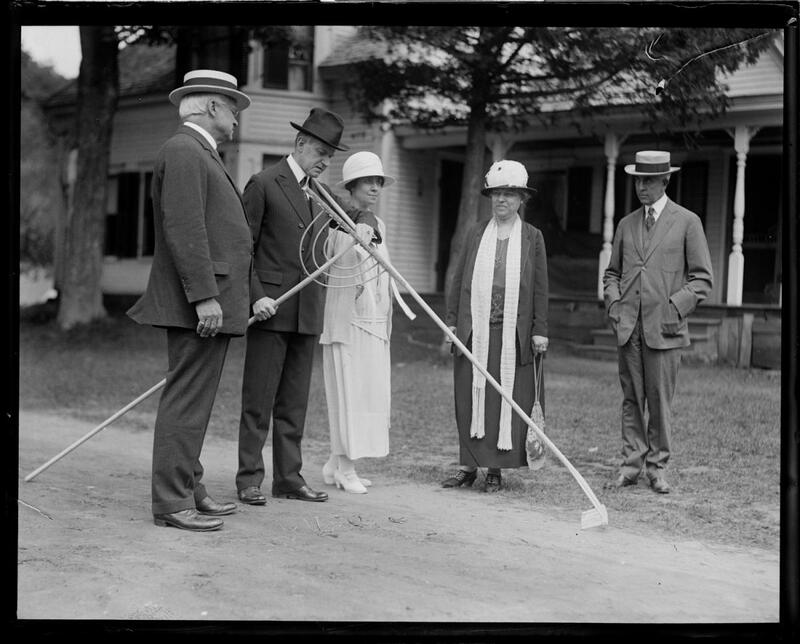 While Coolidge was disappointed to learn that his father had finished all the raking before he arrived, he was glad to accept such kind expressions of regard. C. Bascom Slemp, secretary to the President, stands to the far right of the group. 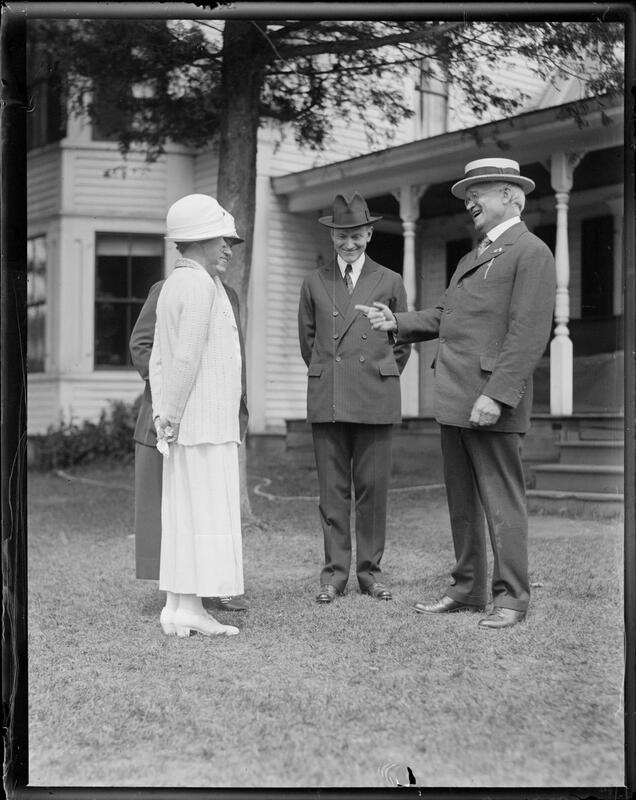 President Coolidge examines the quality of the craftsmanship. 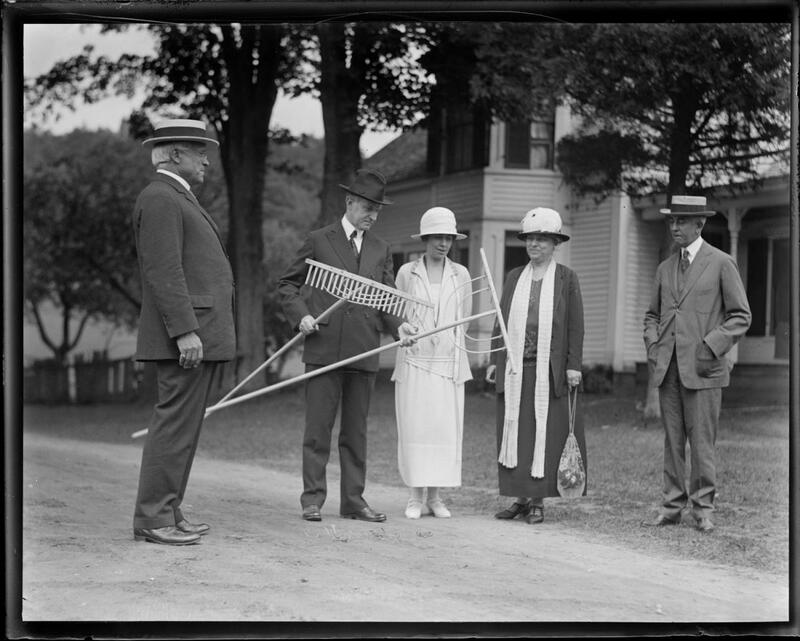 “These are very fine hand-made hickory rakes,” Mr. Treadway declared. “Ash,” replied Cal, carefully looking over the handles and crosspieces. “The teeth are hickory,” the President amended. He then expressed his thanks. They enjoy a few good laughs from jokes told by Mr. Treadway. The Coolidges appreciate this visit from their friends all the way from Stockbridge. 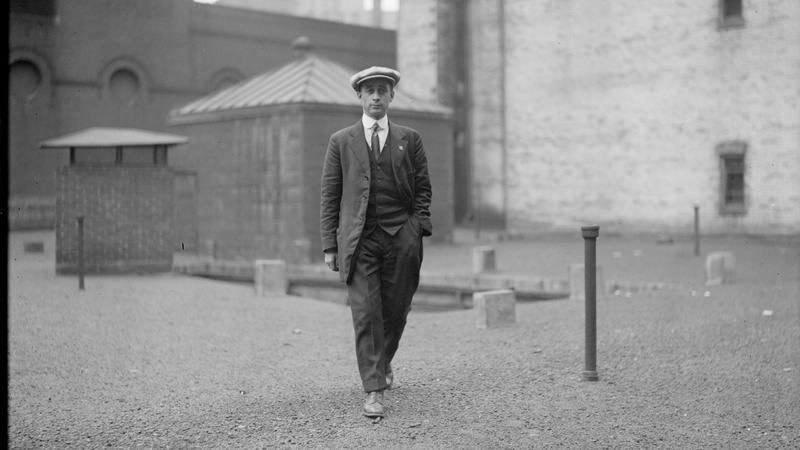 Always considering himself a mere camera-man, Leslie Jones was among the best photojournalists of his era. He helped capture the times in which he lived. 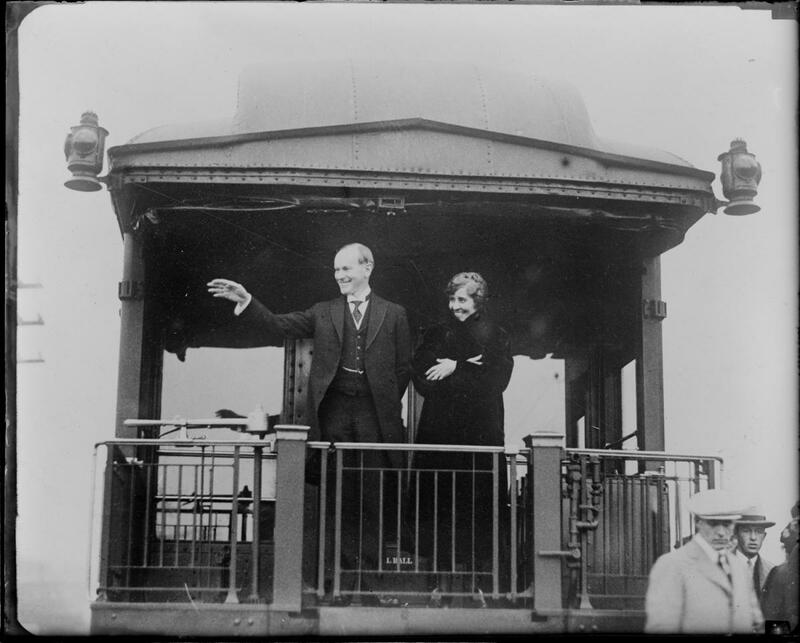 His rapport with Coolidge is evident not only through his presence at just about every stage of Cal’s Presidency but especially at these quiet moments when the Coolidges could have sought absolute seclusion in their grief. Instead, they turned outward to serve others and keep open hearts to friends like the Treadways and Mr. Jones through it all. Most of the Leslie Jones Collection is digitized and graciously made available online at http://www.lesliejonesphotography.com. ← More “Best of Coolidge” on YouTube!